Саарбрюккен ежедневно привлекает любителей шопинга не только из земли Саар, но и из Лотарингии, Люксембурга и Пфальца. Уютные кафе, оригинальные пивные, традиционная кухня земли Саар и рестораны во французском стиле — все это обеспечит незабываемые впечатления от шопинга. Freestyle canoeists leap into the river with their canoes; inflatable crocodiles and ducks are raced against each other, and dragon boats bring a touch of Chinese charm to the Saar. 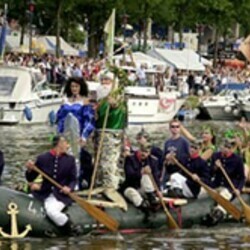 Unusual water sports events are the hallmark of the Saar Spectacular in Saarbrücken, which attracts some 300,000 visitors every year from Germany and abroad. In the evening there's a free programme of music on two stages, whilst special effects bathe the bridges, the riverbanks and the water in colourful light.